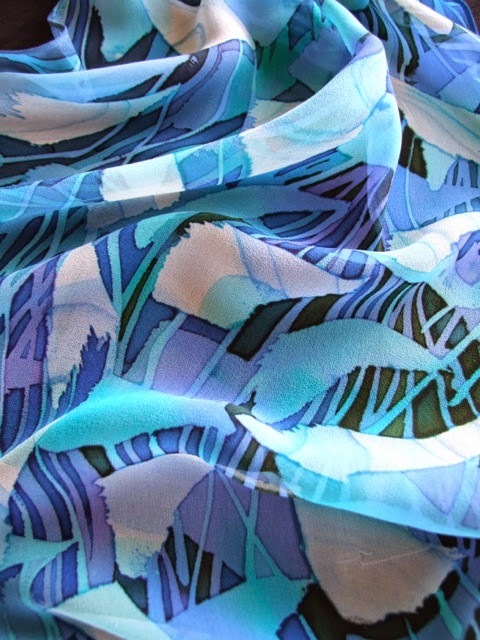 Wax resist is an inspirational medium for those who love vibrant colour, texture and pattern. 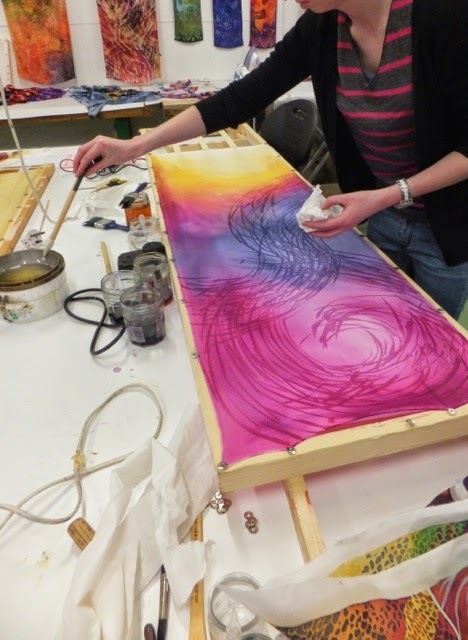 By working several layers of wax and dye on top of each other, a design is built up on stretched silk. The individual layers do not need to be fixed: this is done at the end of the process after the silk is partially de-waxed. Then the work is rolled in paper and steamed. By the end of either of the short courses each student will have produced several practice samples which can be used as starters for embroidery, small items like bags, or even motifs for card-making. 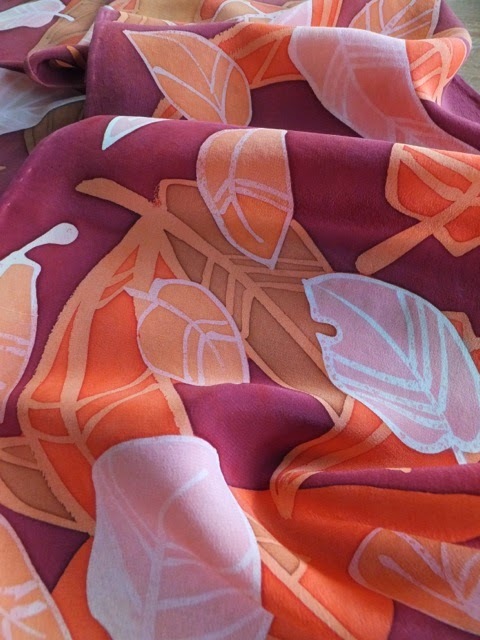 As well as samples they will have created several individual scarves. I don’t teach to a step-by-step formula. Everyone ends up with something different. 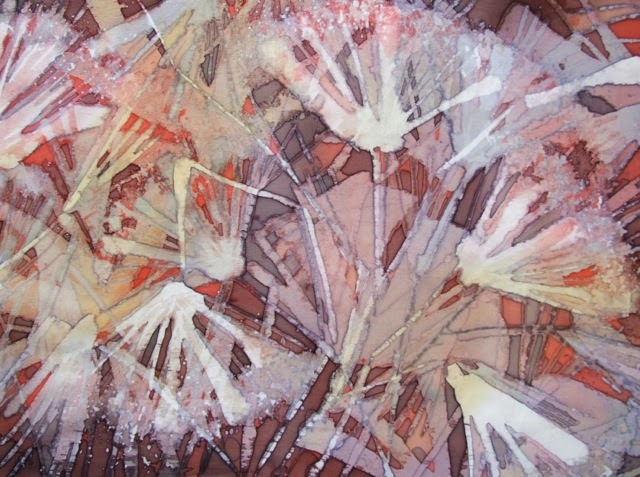 I demonstrate the medium and techniques in various ways, explaining how one can use ideas or images from nature, photos or simple doodles, and various pattern-making tools and equipment. I encourage students to experiment freely on practice samples. They can explore the medium without pressure and find out what aspects of it intrigue and excite them. For every student, it will be something different. Students who are anxious about design are especially welcome! I’ve been teaching design-phobics for years and I believe I can help all students achieve satisfying results through simple and effective techniques and procedures. I provide all the specialist equipment although if students already own a waxpot I’d be grateful if they could bring it. The materials fee guidance in the brochure does not include pre-hemmed silk blanks because these come in different sizes and weights. Students can buy them from me, or bring their own (I will advise students on the sizes which will best fit my frames). Prices for blanks start at around £5.00 per scarf.